A class six teacher in one of the basic schools in the Tamale metropolis has decided to bear the cost of printing examination questions and buying answer booklets for pupils to enable them write their end of second term examination. This comes on the back of a decision by the Ghana Education Service to stop billing parents for the printing of such papers. The directive which has since generated public debate has compelled teachers to write examination questions on chalkboards for pupils. Some of the teacher who spoke on condition of anonymity, aid writing on the board is too cumbersome for teachers and pupils. “I had to print the questions to help my class pupils and also facilitate the examination process. Imagine writing over 20 mathematics questions on the chalkboard for these pupils to answer, how can they write,” one of the teachers quizzed. Another school Citi News visited revealed that management of the school liaised with the PTA to pay 10 cedis for the printing. “The parents insisted that they would pay for the printing fee. 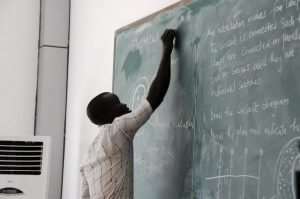 So we sent a copy of the agreement to Metropolitan Education Directorate,” one of the teachers told Citi News. However, checks in other schools particularly in the peri-urban areas of the metropolis saw teachers writing on the chalkboard.